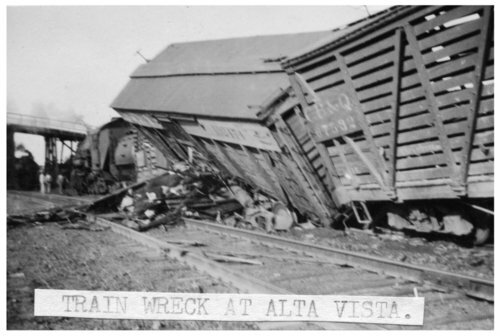 These seven photographs show a train derailment and wreck at Alta Vista, Kansas. In a number of the photographs, toppled cattle cars are visible as well as dead cattle. In another view, workers can be seen atop the wrecked rail cars. A steam wrecker can be seen attempting to lift the derailed engine.